Translation: A fire was declared in the roof space before spreading throughout the roof. The spire collapsed on itself at about 20h [8 pm] and all the wood structure appeared to ignite. 400 firemen came to the fire. After more than 4½ hours of fight, the firemen were able to save the two towers, but two-thirds of the roof was devasted. Constructed during 182 years, from 1163 to 1345. The most visited monument in Europe, the cathedral is visited by 13 to 14 million people a year. Interior floor area: 4,800 m². The cathedral can welcome up to 9,000 people at the same time. the Arnault family (owners of the group Louis Vuitton Moët Hennessy) have pledged €200 million. the Bettencourt family (L'Oreal) has pledged €200 milion. Vinci, major player in road, bridge and similar constructions, "proposes to provide part of the financing as part of the national subscription and by offering its employees to join the collective effort, to assist the architects of Historic Monuments in order to evaluate the necessary efforts, and to participate in the reconstruction if its contribution is considered useful by public decision-makers". Groupama are offering 1,300 oak trees from their forest in Normandy. You may be wondering about the reports of 'treasures' being saved from the fire. Most of these were stored in the Treasury, not the main cathedral. 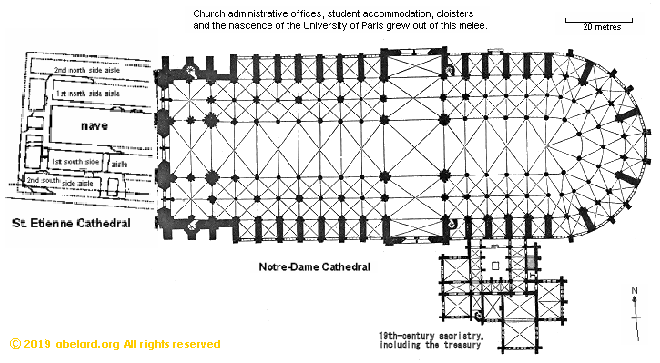 As you will see in the plan below, the Treasury is part of the Sacristry, and built in the 19th century as part of the huge rebuilding and refurbishment supervised by Eugène Emmanuel Viollet-le-Duc following the widespread destructions of the French Revolution. Despite the apparent fragility, these cathedrals are immensely strong and, fundamentally, structurally sound, otherwise they would not be standing a thousand years later. Many have survived the viccisitudes of history, despite vandalism and miscalculations. Naturally, the damage to the stained glass will be considerable, but the glass-makers' craft has advanced greatly over the last century and great efforts have been made to photograph and detail every part of historically important glass. Thus, the glass can be recovered to a great degree in our marvellous, modern world. And now I am discovering (working from too little information) that it appears the whole forest has gone up, but most of the stone vaulting remains intact. There is one large hole in the vaulting, I think over the crossing of nave and transepts. If that is so, this hole is probably ripped open by the fall of (Viollet-le-Duc's) spire. There appears to be a minor vault hole in the nave. If this assessment proves accurate, it is likely that the cathedral has escaped catastrophic damage - I shall review this paragraph as I collect more detailed information. 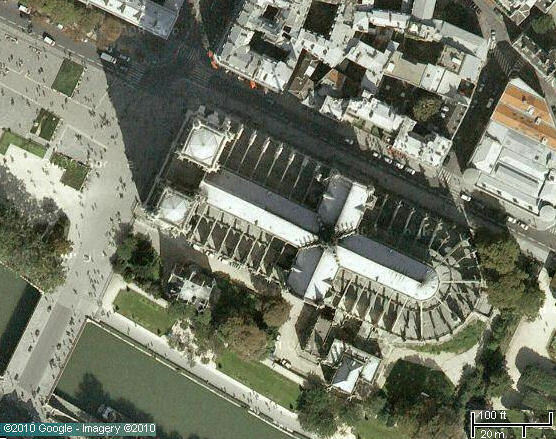 Satellite view of the sacristry at the cathedral Notre Dame de Paris. 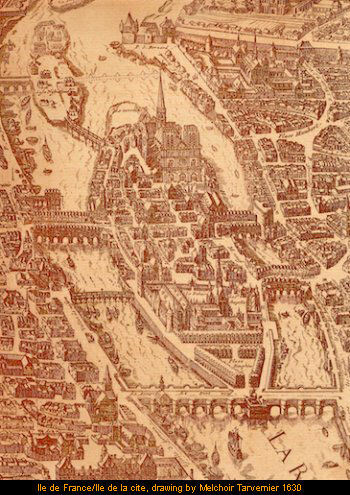 In the time of Pierre Abelard, the Île de France - which is now known as the Île de la Cité - was a small, growing centre of the rising power of Paris. This eventually developed to become France. This page a companion and background to the cathedrals section and the section about Abelard. Virtually nothing remains of the original Île de France from the time of Abelard. There is just a small section in the Cluny Museum. 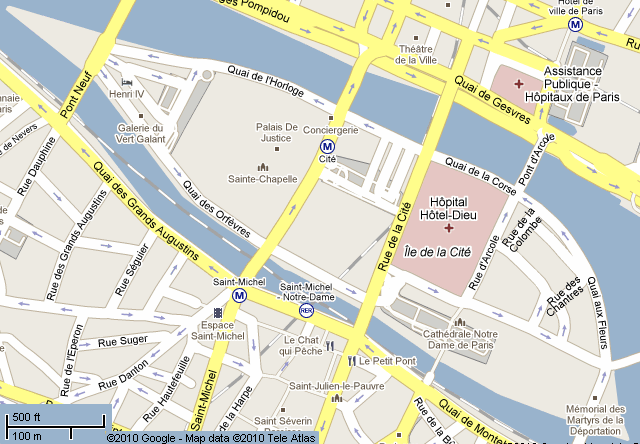 In fact, very little of Paris extends back to Abelard. There is an abbey tower across the river, and that’s about the lot. 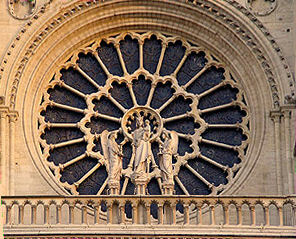 Notre-Dame cathedral, in the photo below, was started after the death of Abelard, replacing an earlier cathedral dedicated to St. Stephen (St. Étienne). That cathedral extended forty metres forward of the west front of the modern cathedral. It was narrower than the present structure. I believe that the old cloister where Abelard would have taught is probably on the north side and to the north of the current cathedral. The island was, essentially, divided between church and state, with the church at the eastern end of the island where the cathedral now lives. But Henry II had a fatal flaw. His child-raising skills left much to be desired. So when Richard I took over, he was far more interested in adventure and becoming one of the greatest generals of all time. In the end, this got him killed. 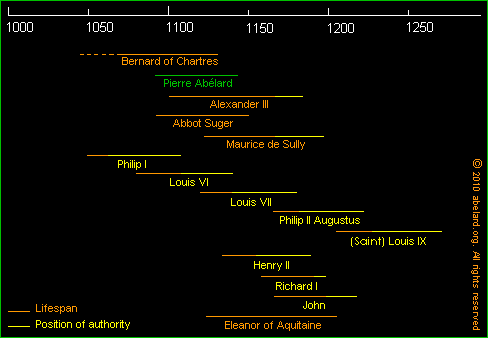 Poor John tried his damnedest to hold together the huge empire his father had built, but those pesky French kings with their long experience steadily outmaneuvered the Angevins and their successors, slowly eroded the Norman grip in what is now France. You might surmise that, if you were an English nationalist, that it was the French who were better at being perfidious, or you might call it crafty. The basilica of St Etienne existed for about six hundred years before Maurice de Sully, the new bishop of Paris, decided to raze the dilapidated building and construct and much bigger and more beautiful edifice, dedicated to Our Lady. Note how the central ceiling is supported by sexpartite vaulting. As the form developed and experience was gained, the builders realised that between the pillars there was very little load-bearing. The structures then became increasingly ambitious, and ever more airy and light-filled. 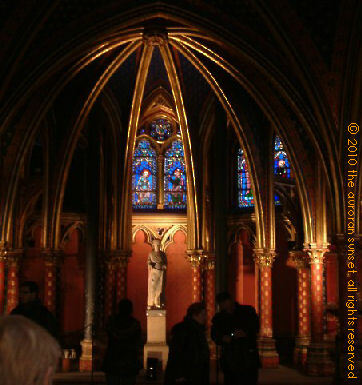 This development can be appreciated in the nearby Sainte-Chapelle, started less than a hundred years later. 1,300 oaks, representing 21 hectares of forest, were used in the timbers and woodwork. The South Rose or Rose du Midi was a gift from Louis IX. The structure of the facade has been broken at least twice. The whole facade was not built well and so was shored up since 1543. The facade was further damaged by a fire during the 1830 Revolution, when Louis-Philippe of the Orléans dynasty overthrew Charles X of the Bourbon dynasty. As a result, another reconstruction was made from 1861. To counteract the sagging masonry, the rose was rotated 15 degrees so a load-bearing spoke was in the vertical, and the facade rebuilt. 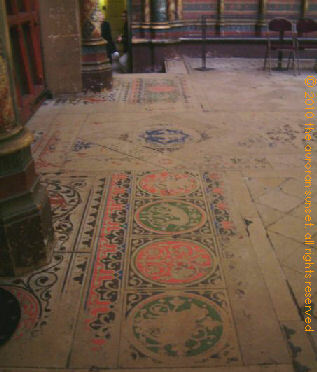 Later, in the 1880s, the glass was also repaired, when the cohesive imagery and design of the stained glass was scattered as the restorer randomly filled gaps with salvaged medieval glass. Beneath the rose is a row of sixteen prophets in lancet windows. The four cental ‘senior prophets’ each have an evangelist sitting at his shoulder, recalling Bernard of Chartres’ words: “If I have seen further, it is by standing on the shoulders of giants”. The four senior prophets are Elisha, Ezekiel, Elijah,and Samuel. The four Evangalists are Matthew, Mark, Luke and John. From the point of view of the stained glass, the North Rose [to the left] is probably the best. The West Rose [below] is the oldest, but restored to damnation. It is difficult to see the West Rose from the interior, organ pipes partially obscure the view. 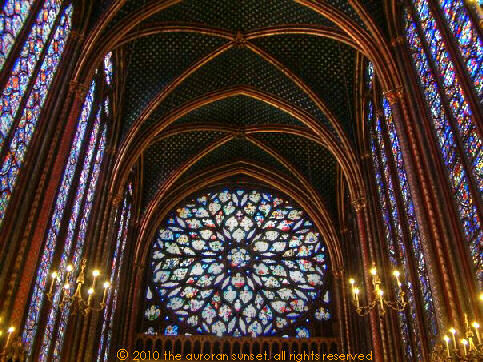 Building of Sainte-Chapelle was finished in 1248, after an incredibly rapid 33 months of construction. This is a bit later than the medieval glass to which I usually attend. But Sainte-Chapelle is a very special place. 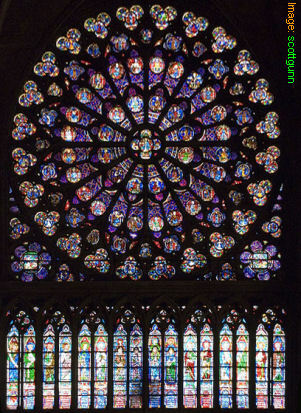 Many of the great medieval cathedrals do not have most of their original glass intact. The overwhelming exception is Chartres, followed at a distance by Le Mans. 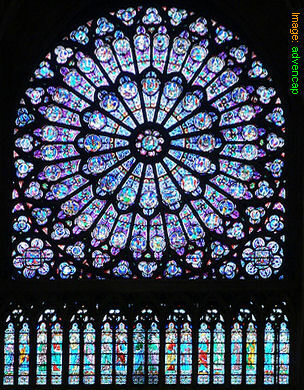 To commemorate the 800th anniversary of Louuis IX's birth, the windows of Sainte-Chapelle have been cleaned and restored. 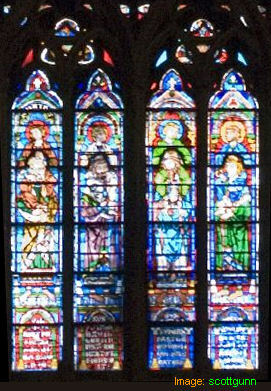 During an operation lasting seven years, the fifteen, 50-foot high stained glass windows were progressively removed, dismantled into small sections, repaired and cleaned. Lasers were used to remove over 750 years of grime - on the exterior, Parisian coal smoke and traffic pollutions, and inside, candle smoke. The exterior of the windows has then received a protective, transparent glass "skin", while much of the leading, separating and holding the pieces of glass together, has been replacd by transparent resin, to let in more light. It will remain to be seen whether that is a restoration step too far. To me, the great interest of Sainte-Chapelle is that it has a full complement of glass, produced in the 13th century and the oldest in Paris, and thus gives an amazing impression of what could be done by the medieval craftsmen. While Sainte-Chapelle is a tourist magnet, it is best to go in off-season, on a weekday, and just find a place to sit and let the incredible light into your soul. It is like sitting in the midst of a magic lantern. Not a place to do too much thinking, but just absorb and absorb. The church really consists of two chapels, linked by a spiral staircase. It is the upper chapel that is so impressive. This is what churches used to be like, before the more modern Puritans, destroyers and ‘restorers’ got their hands on them, from Cromwell to Luther to the French Revolutionaries to various tight-assed puritans across the continent. In medieval times, churches were meeting places which hosted markets and great church festivals, full of colour and life. The glass has 1,134 scenes, with 618 square metres of glass, forming a veritable illustrated bible. One of the twelve statues of the apostles Even the floors are decorated! Sainte-Chapelle, near the Notre Dame cathedral in Paris, a fairly small structure, was built over a period of only five to ten years. It was put up by Louis IX, in a rush, to house the supposed relic, the Crown of Thorns,and so Louis IX could race off on the seventh crusade. Amazingly, Louis had paid more than three times as much for the Crown of Thorns than it cost to build Sainte-Chapelle. Note, a reliquary is the decorated box that holds a sacred relic. The design of reliquaries has been influenced by church design, and visa versa. The shrine of Edward the Confessor in Westminster Abbey is sometimes also regarded as having a visual reference to Sainte-Chapelle. Interestingly, the chapel incorporated a form of iron reinforcement, with two ‘chains’ of hooked bars encircling the upper chapel, the main part of the structure. Further, there were iron stabilisers across the nave (with a vertical tension bar). 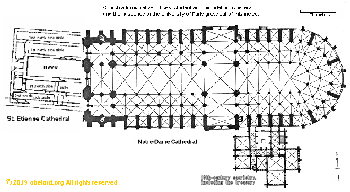 Because of the rather dodgy stability of the gothic buildings, later additions of iron stabilisation can be seen in many cathedrals, for example in Westminster Abbey. 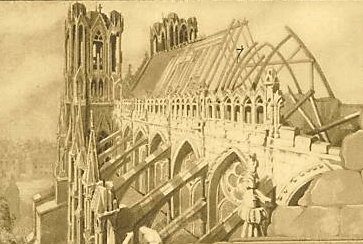 Similarly, wooden shoring is not uncommon during the recent century, while in Sainte Chapelle this innovatory reinforcement is hidden from sight, incorporated into the building. 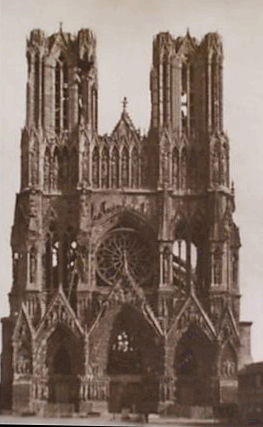 For further discussion, see using metal in gothic cathedral construction. 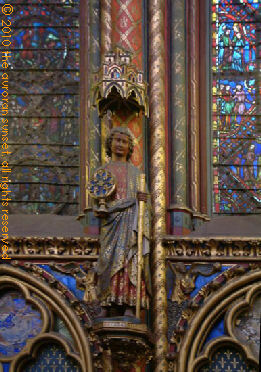 Sainte Chapelle suffered much during the centuries, from repeated fires [1630 and 1736] and even flooding of the Seine . And then, of course, came the French Revolution, Sainte Chapelle was used as a flour store, a club room and an judicial archive. 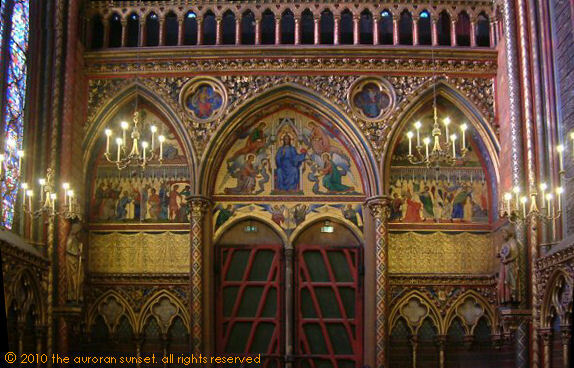 Sainte Chapelle was not handed back to its intended used for about forty years. After the depredations of the Revolution, excellent restoration and refurbishment was supervised by Jean-Baptiste-Antoine Lassus [1807-1857], and continued by Eugène Emmanuel Viollet-le-Duc [1814 – 1879]. At the western tip of the island, is the secluded Place Dauphine, a few steps from the police headquarters where Maigret had his office. Simenon lived round the corner and the Taverne Henri IV was his local. The Brasserie Dauphine was probably the Taverne. Those who enjoy the Maigret books and its main character may wish to visit this real-life heart of his fictional world. The inverted v-shaped accent, called a circumflex, over the ‘I’ of Île, is used in French to indicate a silent ‘s’. Thus the French word ‘Île’ is very closely equivalent to the English word ‘Isle’. This 15th century Flamboyant window of the Apocalypse is a replacement for a 13th century rose. There is an illustration of that older window in the Belles Heures [Good Hours - a illuminated book of hours] of the Duc de Berry. A drawing from Histoire archéologique, descriptive et graphique de la Sainte-Chapelle du Palais by Alfred Pierre Hubert Decloux and Doury, Paris: Félix Malteste, 1857.